If you are those guys who missed the similar Currys offer last week like me, you can order this from John Lewis for an updated price match. It would come with Free Click & Collect or Delivery and 2 year guarantee. Don't forget to register your product on Tassimo Online for a £20 pods voucher. 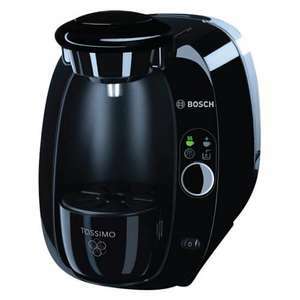 The Bosch TAS2002GB Tassimo coffee maker ensures that a delicious hot beverage is only a touch of a button away! Finished in an elegant black, this Bosch machine uses Tassimo T-Discs to identify the drink selected through unique bar code technology. It then adjusts water, brewing time and temperature in their perfect measurements to provide you with a satisfying drink. And there’s no waiting around either! There is virtually no heat-up time thanks to innovative flow heater technology. Got this from Currys at the same price a couple of weeks ago. Not sure if it came with a 2 year guarantee but the coffee maker is great and for under £40, great value. Making coffee with pods is not cheap but the quality of the coffee is very high, and the pod process clean, fast and convenient, works out at about 50p per cup. Do you have to use pods? I had a Senseo a while ago and you could buy a plastic 'pod' that you filled with your own coffee. Yes you have to use the T-discs. Do you have to use pods? I had a Senseo a while ago and you could buy a … Do you have to use pods? I had a Senseo a while ago and you could buy a plastic 'pod' that you filled with your own coffee. Not used the Tassimo but I do have the Dolce Gusto version. Don't think they are worth the full retail but at this price it has to be a total bargain. OOS online but worth calling a store. Heated. You can ring a store and they can order one from a shop that does have stock to be delivered to your home address for additional £3, I rung Norwich and they searched and found stock and ordered me 1 from Milton Keynes...! hi everyone there is still the black silver model over on Amazon in the used section read description DAMAGED BOXES which works out at £36.31 after the amazon 10% discount which they had on this item yesterday . I had one delivered & 15 were in stock yesterday They do not look used to me on opening, just damaged packaging . I used the Tassimo voucher code which was e mailed after registering machine on Tassimo site. i bought £36 of coffee pods through the Tassimo site & paid approx £16 for those pods because you get free delivery on orders over £35. Tassimo website keeps running out of stock of good pods. Still waiting to use my voucher. Voucher only lasts 6 weeks, so hope they get more in soon. No plastic replacement pod. But there are hacks shown on YouTube. If you want to try a coffee that isn't available in pod form, you can use something like this ebay.co.uk/itm…284 to make it into a kind of percolator, and by using the service disc with a barcode taped to the top (the service disc/pod doesn't get hot enough by itself, so the barcode changes it's parameters). As I said on a Nespresso (which IMO makes better coffee) thread what's the point of buying a pod machine if you then want to faff around with reusable pods, possibly grinding your own coffee, letting it go stale because you did too much in one go, lacking the choice you naturally get by buying different types of pod, etc. You can pick up a basic espresso machine for under £50! It's the point of having both options I think you're lacking. Having convenience when you want it, or more when you don't. Showing as IN STOCK online! Just ordered mine now too, I'm getting the emails telling me its back in stock intermittently, so it is if you are lucky - thanks poster! mine was delivered today even though they told me 8th originally. Went for T40, haven't registered yet as chocolate not in stock for 2 weeks so will wait. Didn't know about price match at john lewis or may have ordered from there. Got this from Currys at the same price a couple of weeks ago. Not sure if … Got this from Currys at the same price a couple of weeks ago. Not sure if it came with a 2 year guarantee but the coffee maker is great and for under £40, great value. Making coffee with pods is not cheap but the quality of the coffee is very high, and the pod process clean, fast and convenient, works out at about 50p per cup. The stock is going and coming back. So, I would suggest you to ask for email notification and buy it for whatever price it would come back to stock as you can get the difference back with a John Lewis Price Match within next 28 days due to Currys Offer. Not used the Tassimo but I do have the Dolce Gusto version. Don't think … Not used the Tassimo but I do have the Dolce Gusto version. Don't think they are worth the full retail but at this price it has to be a total bargain. Are you happy with your device ? It was £49 while ago on on Tesco Direct but I couldn't buy. As I said on a Nespresso (which IMO makes better coffee) thread what's … As I said on a Nespresso (which IMO makes better coffee) thread what's the point of buying a pod machine if you then want to faff around with reusable pods, possibly grinding your own coffee, letting it go stale because you did too much in one go, lacking the choice you naturally get by buying different types of pod, etc.You can pick up a basic espresso machine for under £50! mine was delivered today even though they told me 8th originally. Went … mine was delivered today even though they told me 8th originally. Went for T40, haven't registered yet as chocolate not in stock for 2 weeks so will wait. Didn't know about price match at john lewis or may have ordered from there. So, do not forget to register your device for the £20 Pod Voucher. I was talking about espresso machines being under £50 which crop up on here every so often. Granted they're not Gaggias but I have a cheapie one I bought from Comet a few years ago and does the job. Cheapest Nespresso I'm aware of is the Essenza at Debenhams for £70 (you also get a £40 credit for coffee - so a bargain really). I ordered one of these yesterday and am picking it up tomorrow, can anyone tell me if it comes with any sample T Disks in the box or do I need to nip to a shop and get some ready for its arrival!? I'm going to make a larger order online once it's here but want to test it straight away obviously! ...and wasn't sure if it supplied one or two in the box :-) thank you op! Picked one up last week from Currys, no pods in the box so you will need to pick some up. Tesco had them on offer when we bought it, check mysupermarket for the current prices at the big supermarkets. Was out of stock again first thing this morning, but they now have 'over 10' again so ordering as we speak. It's to replace one we have had for a few years, very pleased with it. Just got my order in!